When I was little, Haloumi was one of those "fancy foods" I would actually eat. I was a really fussy eater and rarely tried anything new, but haloumi was a treat just for my Dad and I. We were the only ones who liked it so he'd cook some up as a special treat for us and it was the one "fancy thing" at restaurants I would happily order and gobble down. Though, it wasn't known as haloumi, it was known as the squeaky cheese. Little did I know, haloumi doesn't actually have to be so squeaky, you just have to cook it properly and slice it a little thinner. 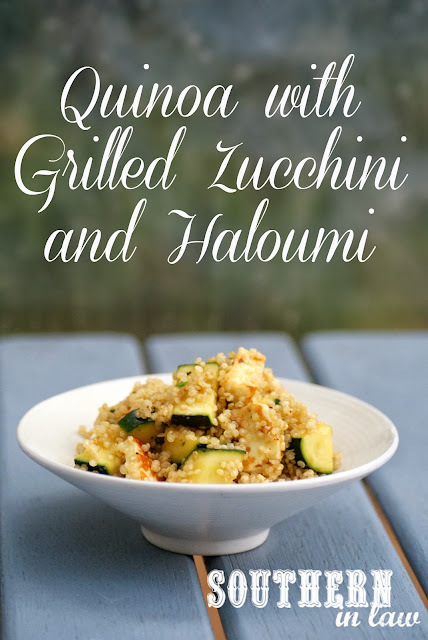 For years, I stuck to eating haloumi just by itself - but now I love incorporating haloumi into different meals - and this Quinoa with Grilled Zucchini and Haloumi is one of those meals! 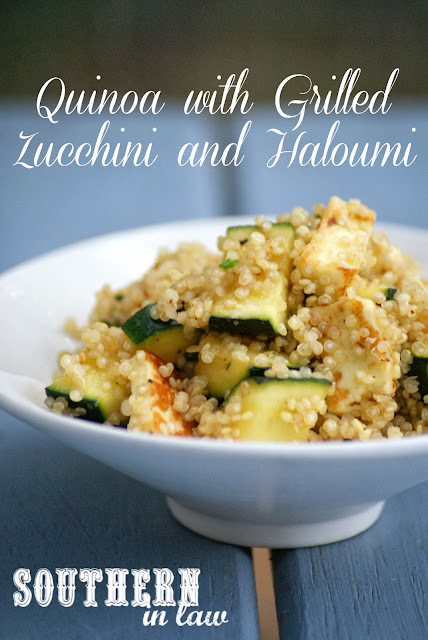 All of the flavours in this quinoa go together perfectly, the unique salty taste of the haloumi, the nuttiness of the quinoa and the ever so slight sweetness from the grilled zucchini - add in some garlic and herbs and you have yourself a winning dish! Season with salt and pepper to taste and add in your herbs and quinoa. Mix over the heat until everything is mixed together and heated through. *Feel free to add a little bit of oil to stop things from sticking here, I can't due to food allergies but it's up to you! You don't really need it, just add a little bit of water if needed. But tell me, were there any (what you thought were) "fancy foods" you liked as a child? For me it was olive oil and haloumi. Dad and I also used to have olive bread dipped in olive oil as a special treat from time to time. Interesting! Never heard of haloumi before! Wait, maybe I have but it didn't stick to my brain. And omgness, it's so hilarious you describe food as squeaky because I've thought the same thing about lots of foods. Sometimes tofu can feel squeaky depending on the way it's cooked, lol. As a child I loved eggplants! I cannnoooot remember for the life of me how it was prepared, but it was an Argentinean dish and I remember I fell in love with it. Then I finally got ahold of it when I was a teenager in Korean form, but it was still yummy. Just wish I could find the recipe to that Argentinean version!